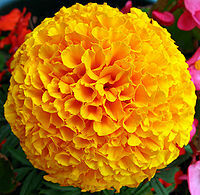 A marigold is an herbaceous plant belonging to the genus Tagetes, of the family Asteraceae (syn. Compositae). Most have yellow or orange, composite flowers.